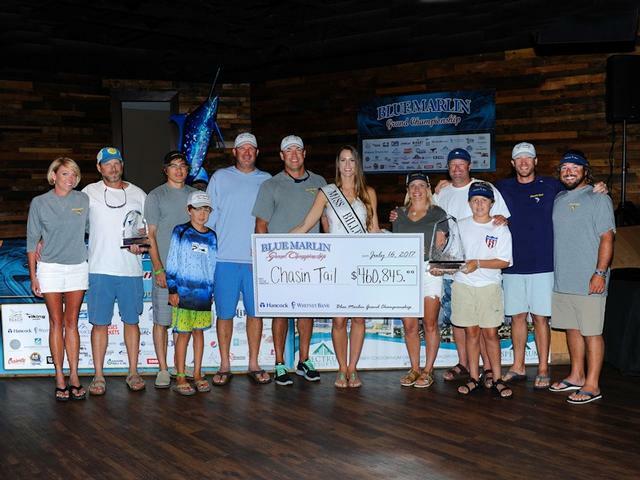 The chase turned into the catch of the week as Chasin’ Tail, an 80-foot Weaver owned by Ryan Engquist of Baton Rouge, Louisiana and his veteran team were crowned the winners of the 2017 Blue Marlin Grand Championship. Capt. 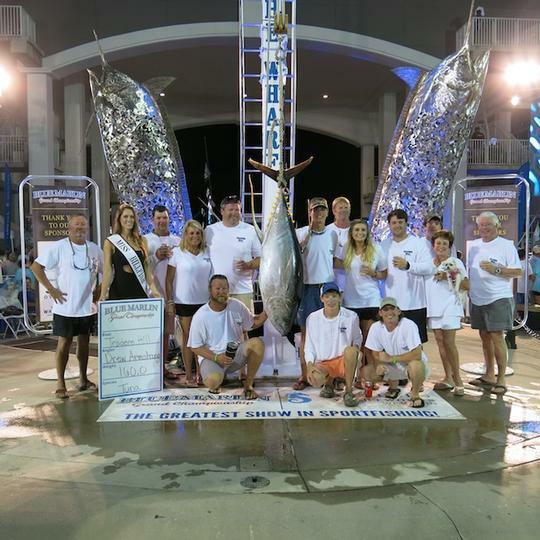 Clayt James, mates Ruston Rood, Parker Rodrique and the family/friends crew brought a 502.0-pound blue to the scales Saturday night to top the field of 63 other competitors. As a result, Chasin’ Tail won $460,845, a sizable chunk of the record $1.55 million overall purse. 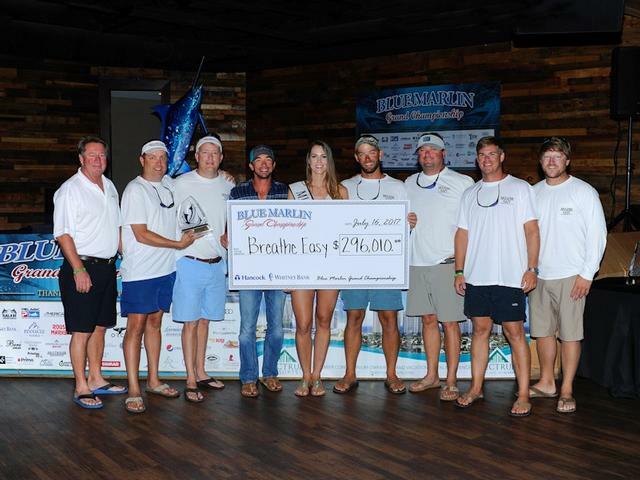 Breathe Easy, the 2016 Gulf Coast Triple Crown Champion, finished in second place overall, without weighing a billfish. Capt. 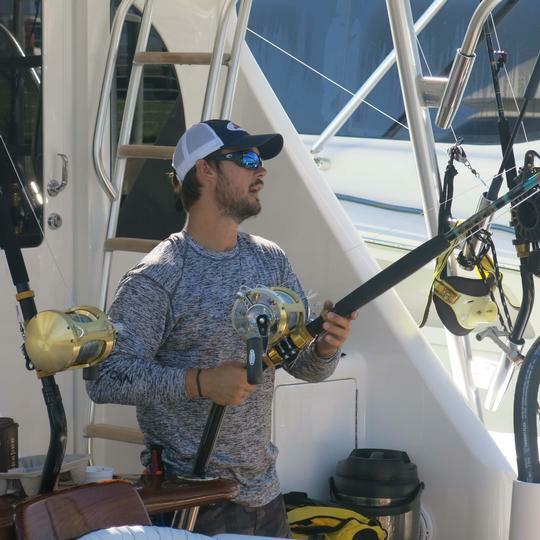 Patrick Ivie, owner Matt McDonald and the team scored four blue marlin releases, along with a 143.4-pound yellowfin tuna, to earn a consolation payout of $296,010 including optional jackpots. 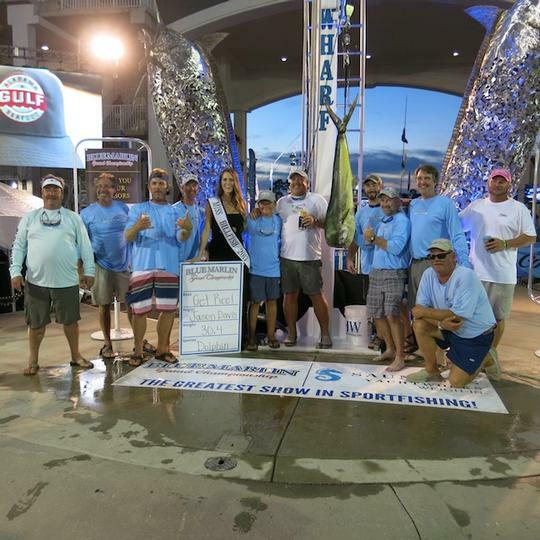 Another previous Triple Crown Champion, Done Deal, finished second in releases with three blues to its credit, thanks to the performance of the top lady angler, Katie Gonsoulin, daughter of owner Jon Gonsoulin. With optionals, Done Deal won $149,445 for the week. Capt. Jason Buck runs the 70-foot Viking. Three other blues were weighed that exceeded the new 106-inch minimum length re-quirement. 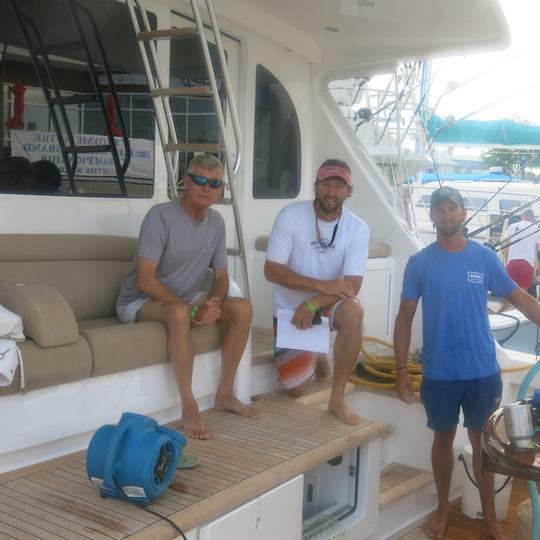 Bonner Williams and his team mates aboard Rascal, a 63 Hatteras GT owned by Harris Morrissette and run by Capt. Nick Milsap recorded a 466.4-pound fish. That catch was worth $12,690. 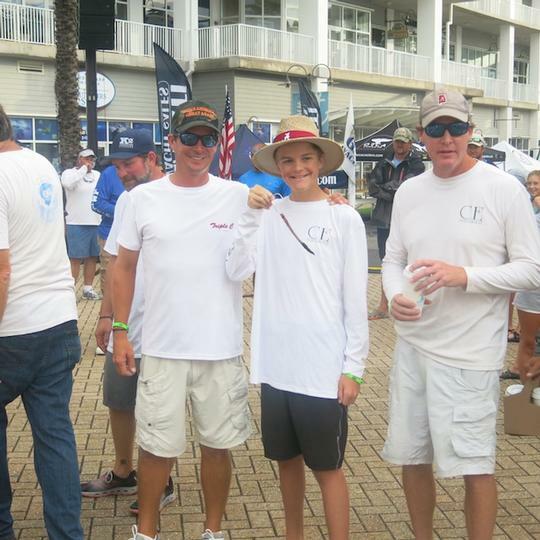 Fourteen-year-old Ryan Cooper, competing aboard CE, had a remarkable run offshore. 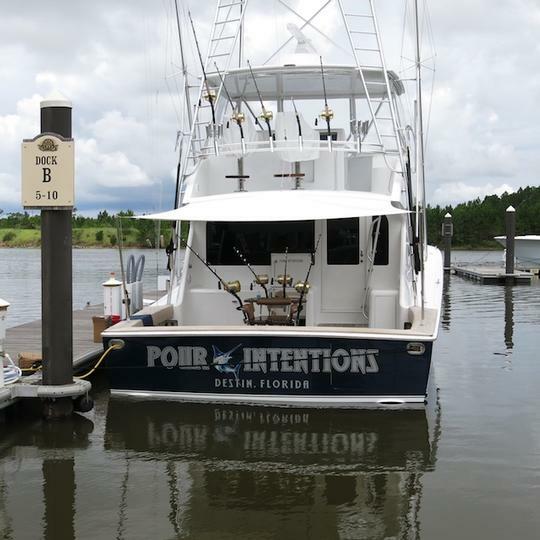 In addition to weighing a 437.6-pound blue, he also released a Grand Slam (another blue, white marlin and sailfish) in 20 minutes and boated a 28.2-pound dolphin. Combined with dad Scott Cooper’s 28-pound bull, Team CE won $104,310 for its fourth place finish and jackpot entries. Capt. 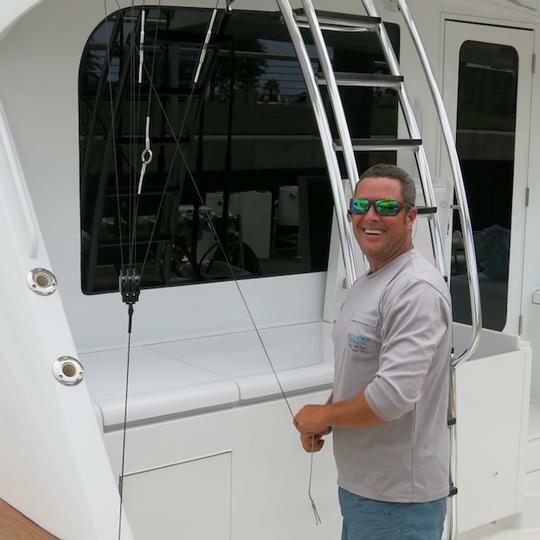 George Crenshaw is the skipper of the 65-foot Hatteras. Ryan was named the top Junior Angler for 2017. 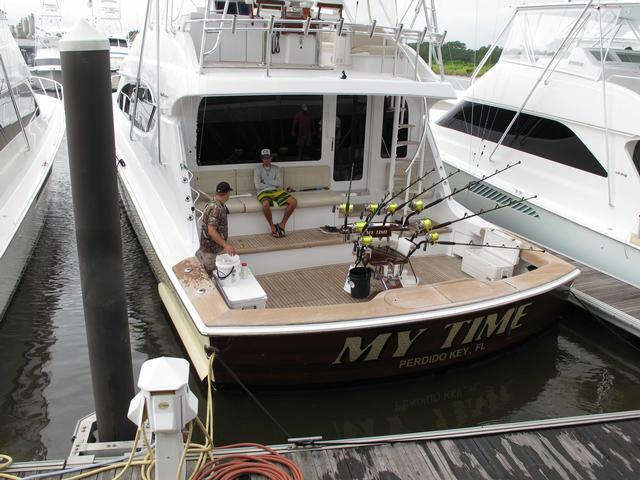 Owner/angler Michael Hobbs, fishing on Gotta Believe, a 60 Miller with Capt. 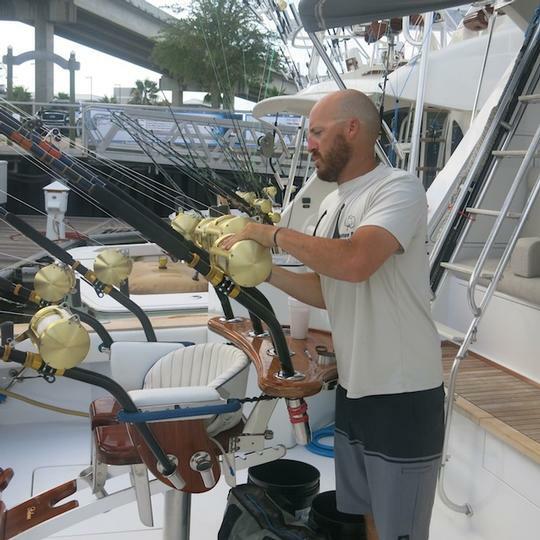 Trey Wise at the helm, recorded the last weighed marlin. The 422.6-pounder was worth $74,880. Quick Time, a 70 Viking run by Capt. Shelby Johnson, was the third-place Release Team, with 1202 points. Those efforts were good for a $68,130 check. 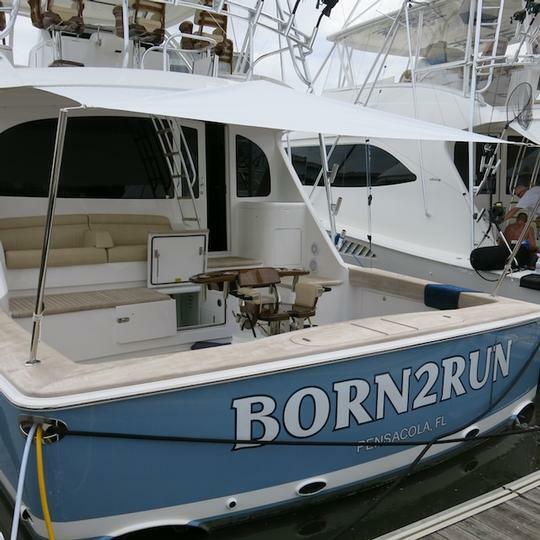 A total of 28 blues, 17 white marlin and 3 sailfish were released by the tournament fleet and verified by the video judges. 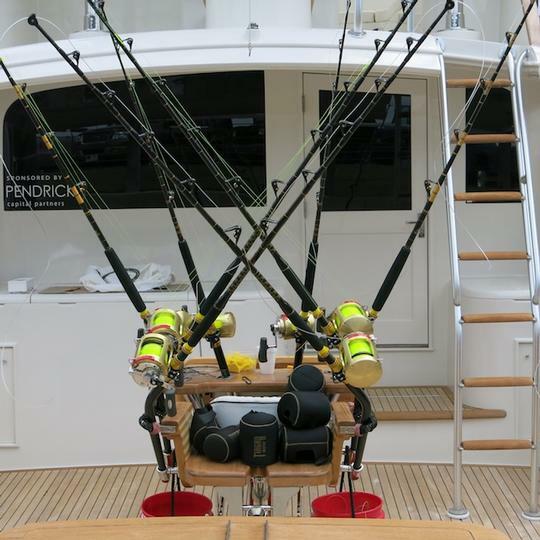 Blue marlin scored 501 points apiece in the hybrid scoring format. 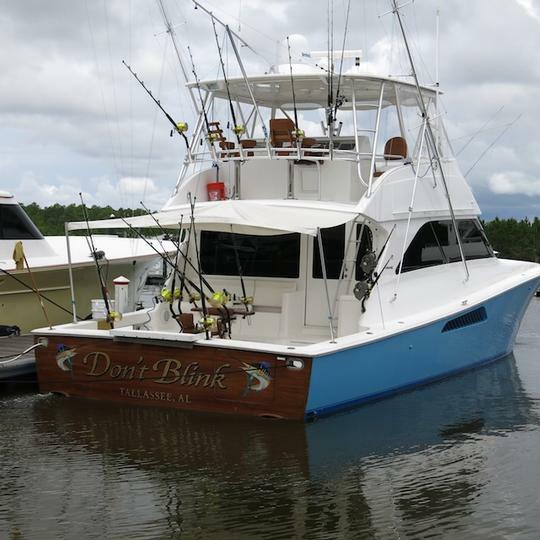 Jason Benton, owner of Don’t Blink, a 56 Viking run by Capt. 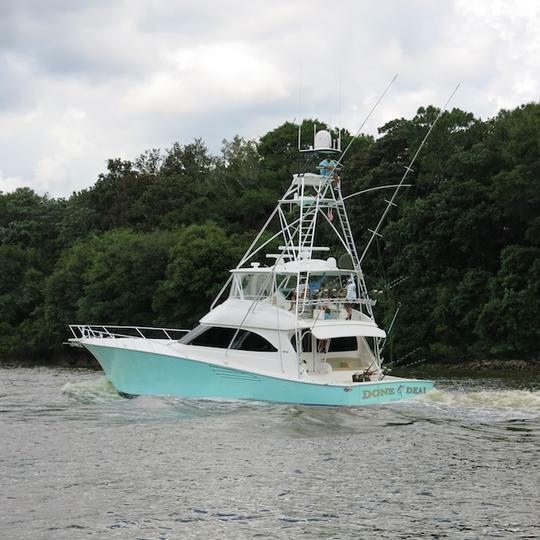 Skip McAllister, was the top rod in the tuna division. 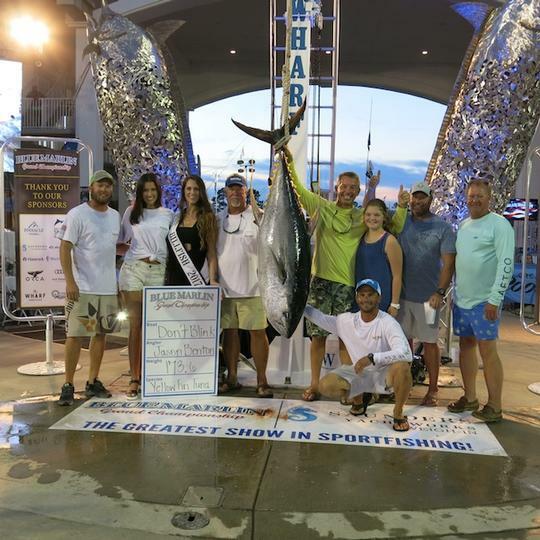 He and his team earned $67,500 for a 173.6-pound yellow-fin. Traders Hill and lady angler Marshall Powell was second (160 pounds/$48,150), while Zack Fisher on Jacquelyn was third (147.2/$4,590). 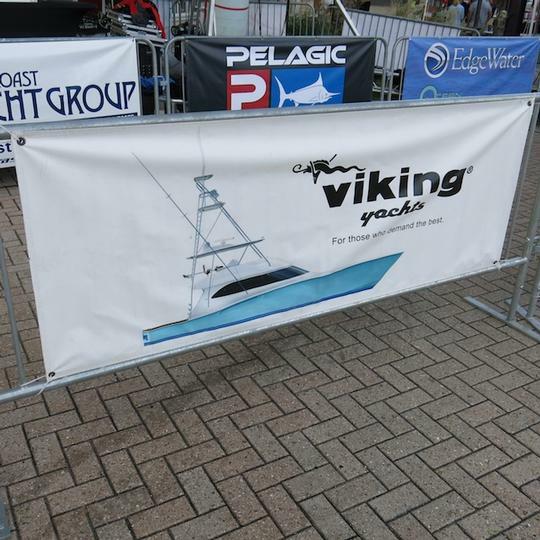 Other boats earning tuna payouts include Aldente, Rising Sons, Sea Spray and Team Supreme. Casey Carter on Buckshott (Capt. 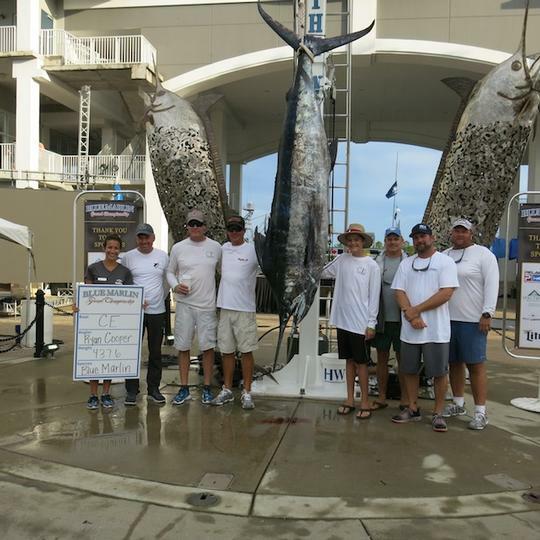 Hunter Junek/45 Cabo) caught the top wahoo, a 49.4 fish worth $20,250. 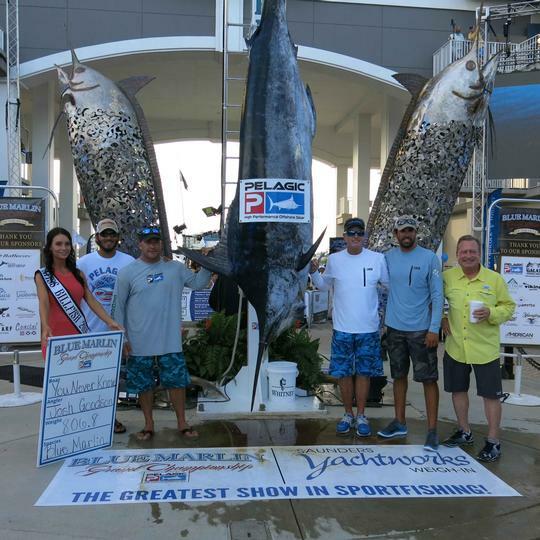 Rachael Wilkinson on Sweet Liberty II was second with her 44.4-pounder, and Ralph Morrison on Relentless Pursuit rounded out the field with a wahoo that tipped the scales at 40.6 pounds. Pipe Dream and Iona Louise also won wahoo jackpot money. Jason Davis on Get Reel, a 60-foot Hatteras with skipper Sonny Alawine at the controls, wound in the largest dolphin at 30.4 pounds. 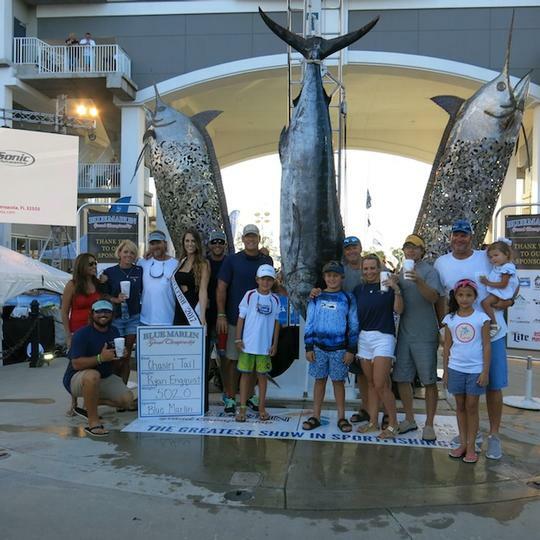 Add in team mate Todd Davis’ 21.4-bull and Get Reel is taking home a check worth $74,700. CE locked down the other two spots while Team Supreme added a jackpot bonus. Many of the younger anglers fishing the 2017 Grand Championship have probably never heard of the ‘60s rock group Jefferson Airplane, let alone know their song catalog. But you can bet old salts on four particular boats were blasting Plastic Fantastic Lover as loud as the tweeters and woofers would allow. That’s because every blue marlin weighed in the 2017 Championship was caught on trolled lures, not live bait, proving that old school is still cool. 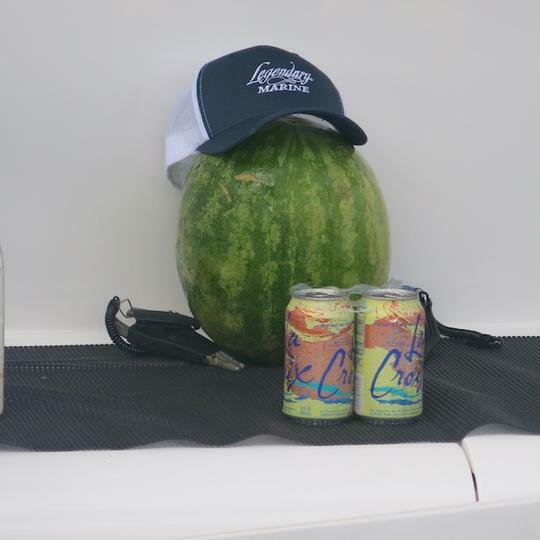 First to the scales Saturday night was Rascal, a 63 Hatteras with Bonner Williams in the fighting chair. It took Williams a little more than two hours to whip his 466.4-pound blue after it ate a pink, blue and white Moldcraft Softhead with a single hook rig. The boat was making a last pass around the Horn Mountain platform before it had to quit fishing to make it back in time. That weight pushed the team into first place, albeit briefly. 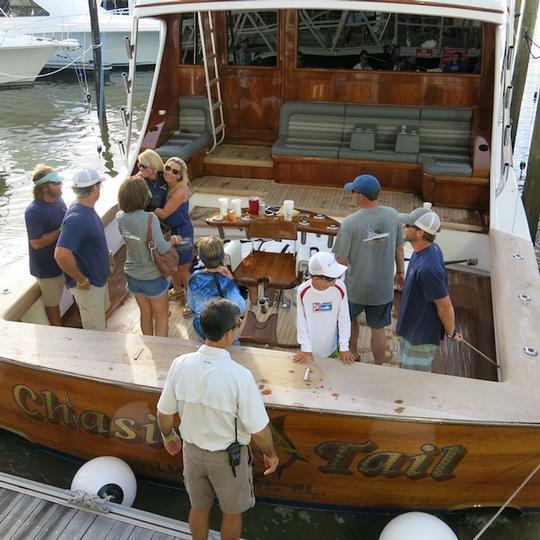 Veteran Orange Beach skipper Clayt James and his team aboard Chasin’ Tail, an 80 Weaver, was next up after making the return trip 246 miles from Green Canyon to the Mobile Bay buoy. Angler Ryan Engquist and his team mates were trolling a black and red Black Bart 1656 lure Friday when their marlin pounced. The battle only lasted 50 minutes but the fish didn’t give up easily. Gotta Believe was the last boat to join the fake bait party. Angler and boat owner Mike Hobbs Jr. weighed his 422.6-pounder after it was fooled by a Pakula Blue Lumo lure. 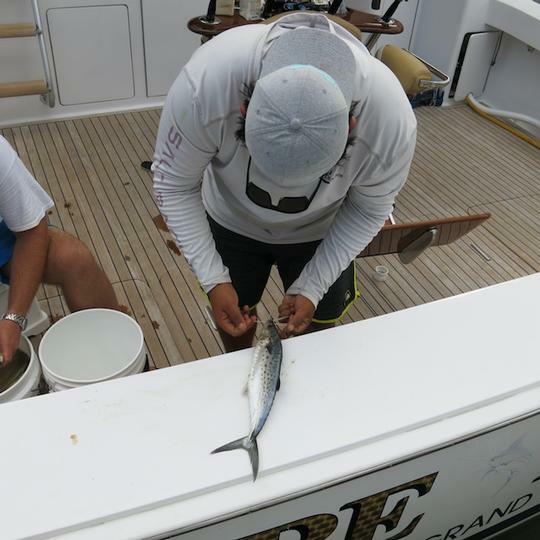 The team also released a white marlin and a smaller blue before boating their weight fish. The early bird winner, CE and junior angler Ryan Cooper, got right back into action after leaving the Wharf Marina Friday morning. 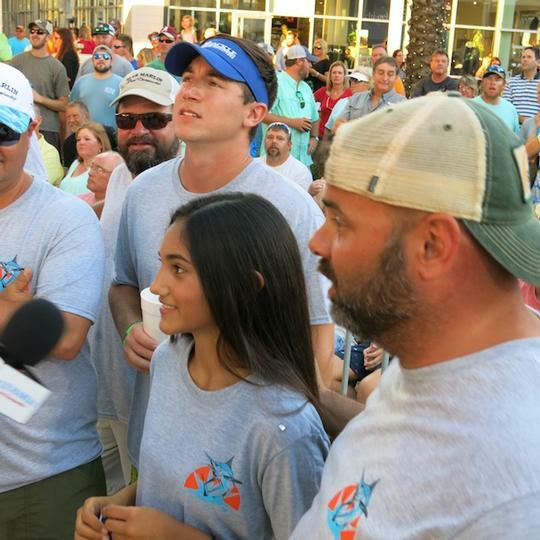 The 14-year-old teenager released a 500-pound blue (their first fish weighed 437.6 pounds, caught on an acrylic swimming lure), followed by a white and sailfish for a grand slam, all in less than an hour’s time. Ryan would also score a 28.2-pound dolphin while dad Scott wound in a 28-pounder. 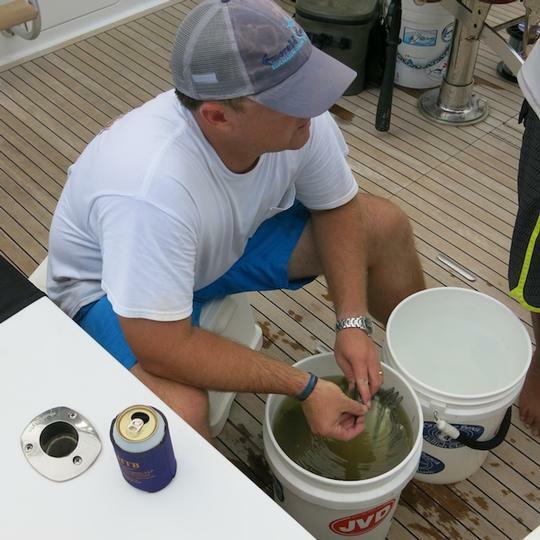 Before the night was over though, those mahi were capped by Jason Davis with a 30.4-pound bull aboard Get Reel. The weights of the yellowfin tuna brought to the scales kept increasing all night long. 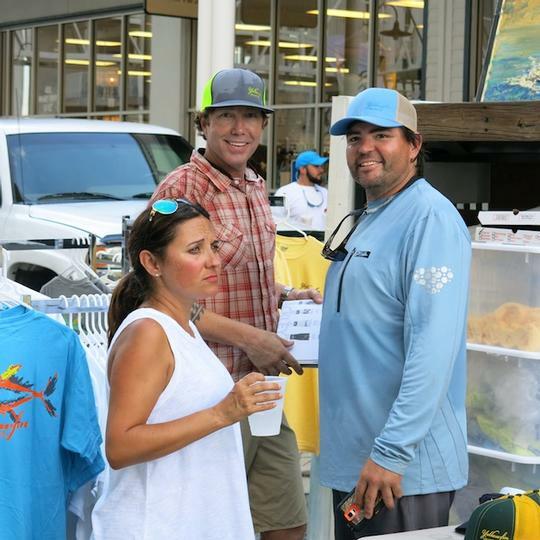 Jason Benton, owner of Don’t Blink and this year’s Emerald Coast Blue Marlin Classic Champion, scored yet again when he scaled the largest tuna at 173.6 pounds. 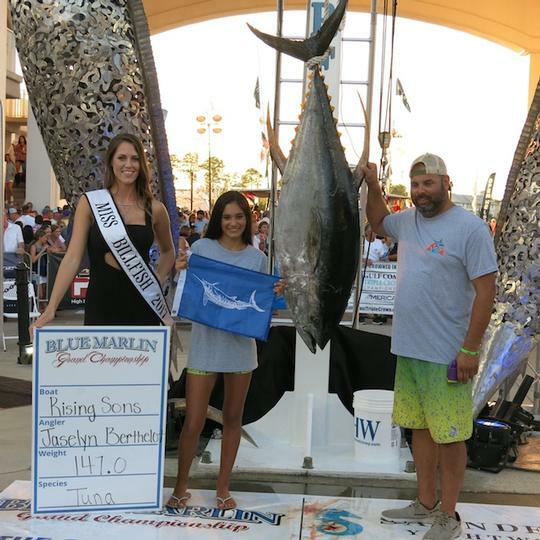 Traders Hill was second with a 160.0-pound yellowfin, followed by Jacquelyn (147.2). 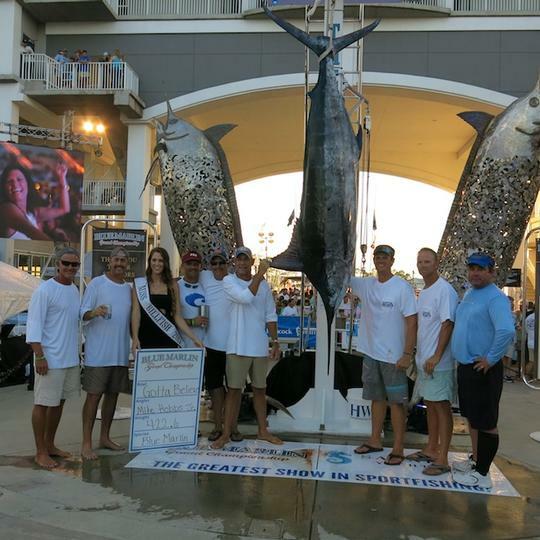 No monster wahoo were recorded by the 64-boat fleet, but Buckshott came out on top with a 49.4-pound speed demon. Sweet Liberty II was second ( 44.4), while Pipe Dream boated the third largest ‘hoo at 41.2 pounds. 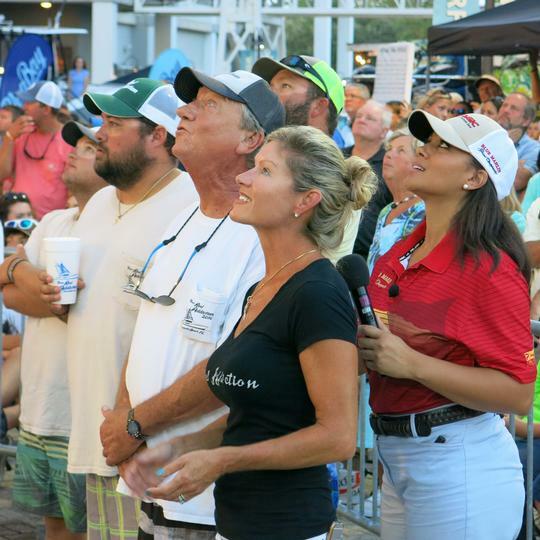 The video judges were still verifying catches for the complete standings in the release division, but Breathe Easy captured the top spot with four confirmed blue marlin to its credit. Done Deal was second in the standings and Quick Time was third. 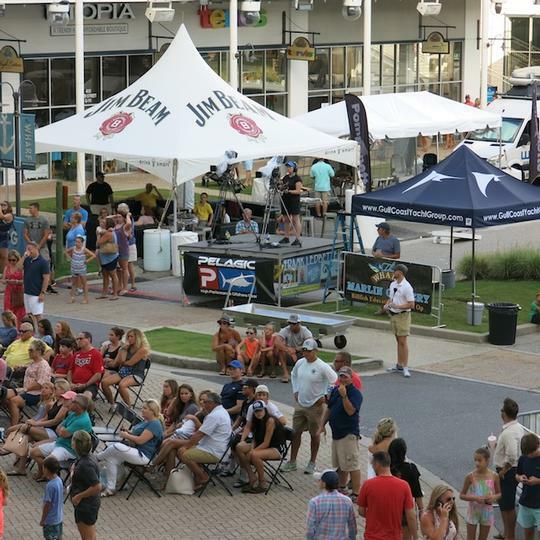 The early risers, coffee cups in hand, were treated to a rare show, but Friday evening’s crowd will have to make a return trip if they want to see the giant billfish and tuna that will surely grace The Wharf scales come Saturday. 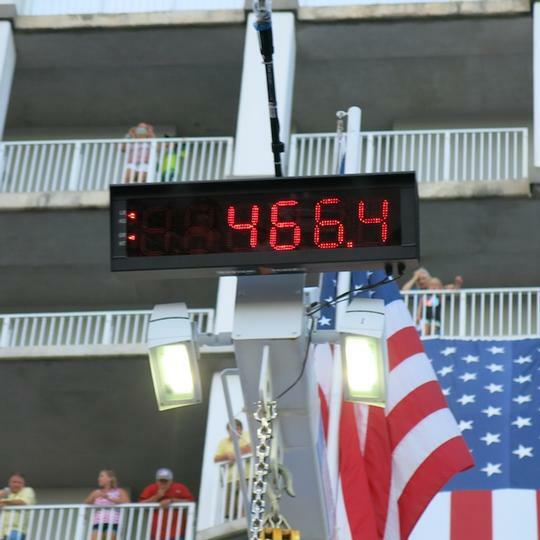 CE made an early splash by weighing a 437.6-pound blue, the first-ever morning weigh-in for this event. No other boats opted to make the long trek back for the evening session though. So the 64 boats competing will continue to fish. 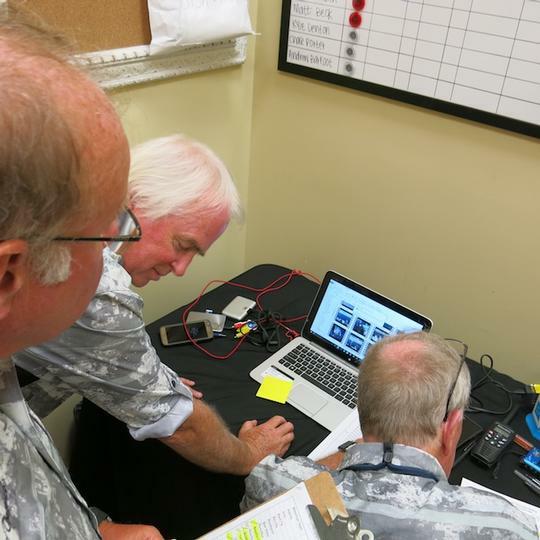 All have to be checked in before a 7 p.m. deadline for catches to count. Tournament director Scott Burt did get a satellite call from Chasin’ Tail with a report it had boated a blue which taped at 111 inches. That fish was caught in the Green Canyon, more than 200 miles southwest of the marina. In comparison, CE’s fish officially measured 109 inches, three more than the new required minimum. Length is not always a definitive marker, however, as some shorter marlin have a much bigger girth or belly which adds extra pounds. So the wait—and anticipation—goes on. 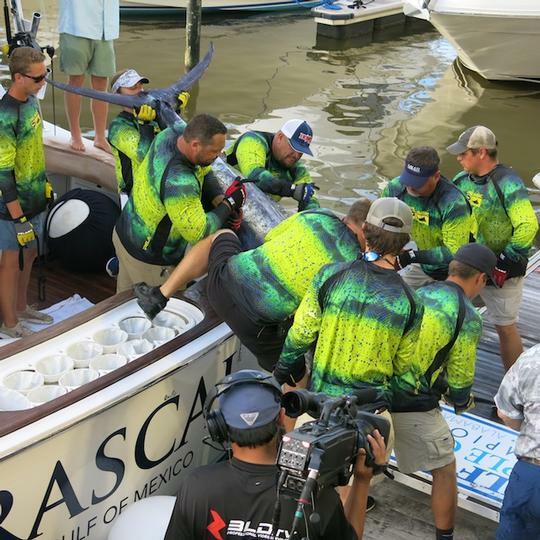 With more than $1.55 million dollars on the line, crews that boat fish will be doing everything they can to preserve every precious ounce. The lack of entries didn’t stop a line-up activities at the scales though. 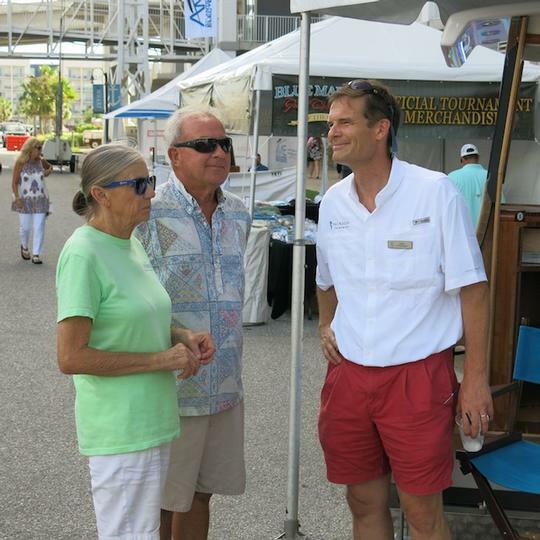 Between a celebrity chef competition to the fighting chair contest to raise money for St. Jude Children’s Hospital to the sponsors showcasing their products and services, the Wharf’s palm-lined boulevard was a bustling scene. 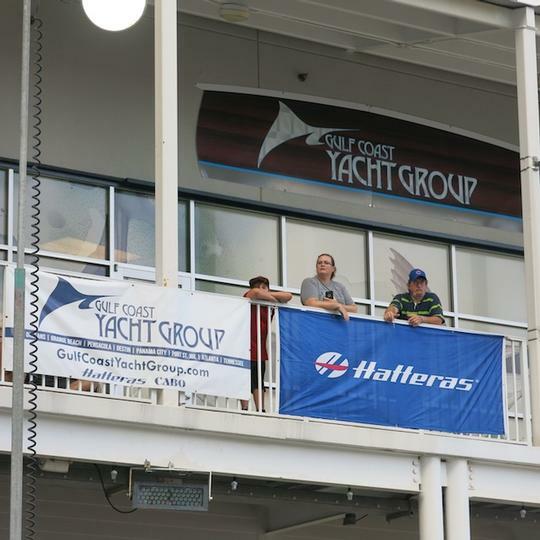 John Fitzgerald, president of Saunders Yachtworks, had a front row view as the 2017 Weigh Scales Sponsor. 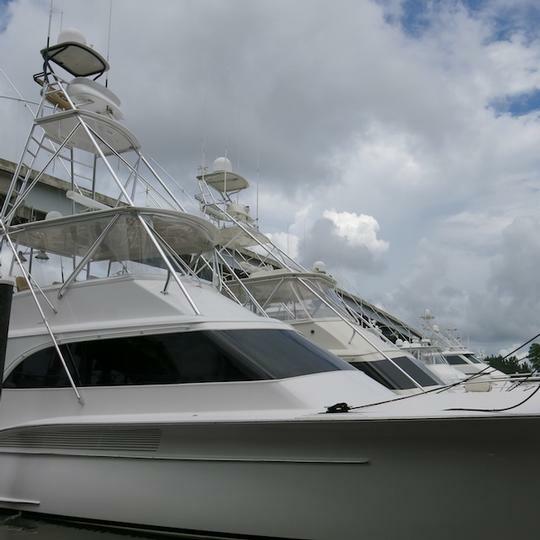 The company has been in the yacht support business for 58 years. 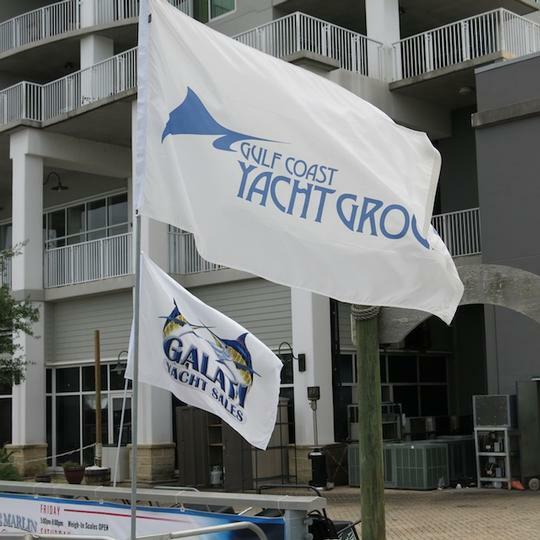 “This is our biggest tournament among the nine we sponsor across the Gulf Coast from Texas to Sandestin,” Fitzgerald says. 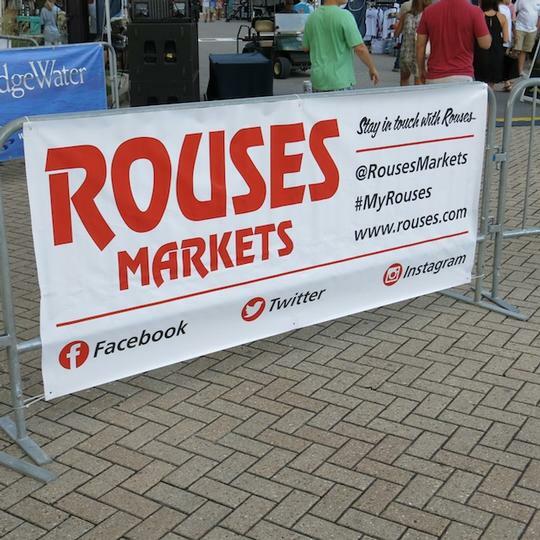 “It puts us front and center for the big crowds and our customers. 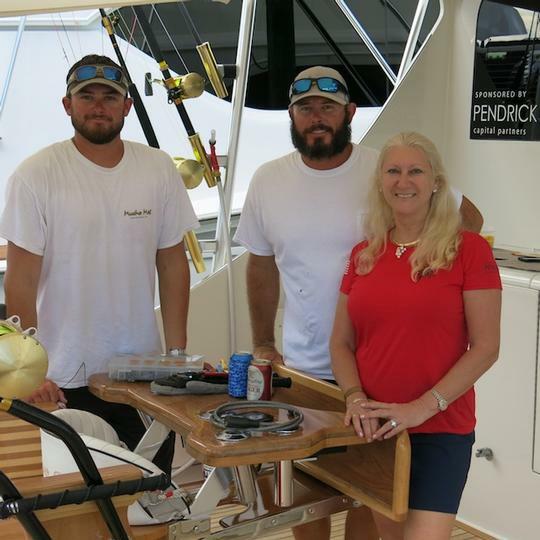 We deal mainly with the captains when they bring their boats in for service, so this gives us the opportunity to spend time with the boat owners and their families. 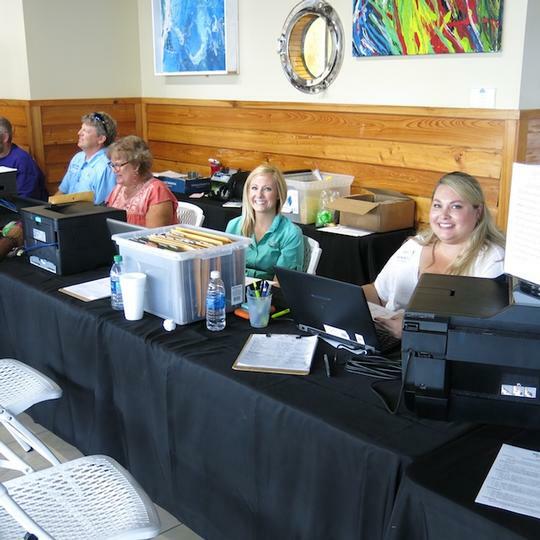 We always enjoy being part of this event.” In addition to a full-service yard in Gulf Shores with a 150-ton lift capacity and newly opened long-term storage yard, Saunders Yachtworks has a self-service facility in Orange Beach. 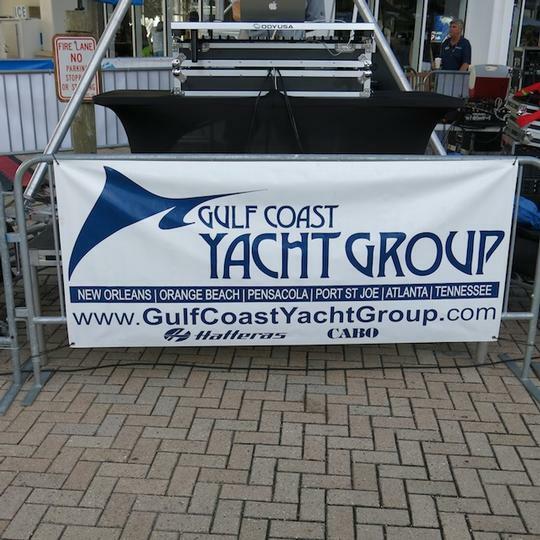 Tim Jones, the general manager for the Gulf Coast Yacht Group, is another key BMGC sponsor. 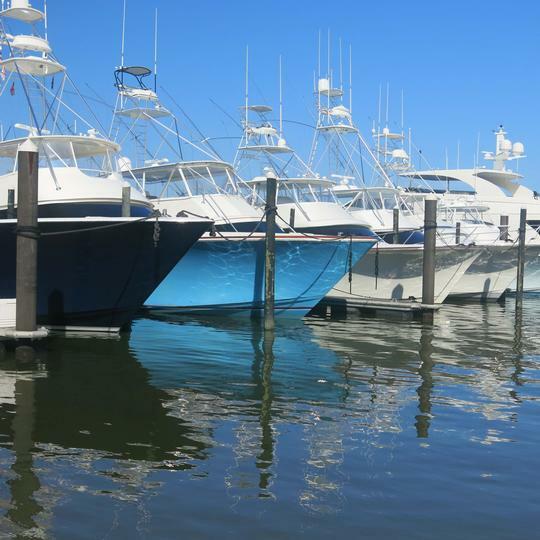 The long-time Hatteras dealer has offices in several locations throughout the northern Gulf. 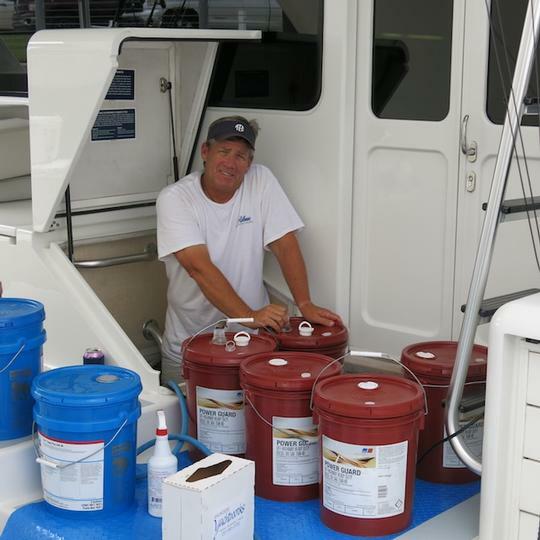 Jones got his start in the marine industry as a diesel mechanic decades ago and has witnessed the evolution of the sport along the sugar-sand Alabama shores. 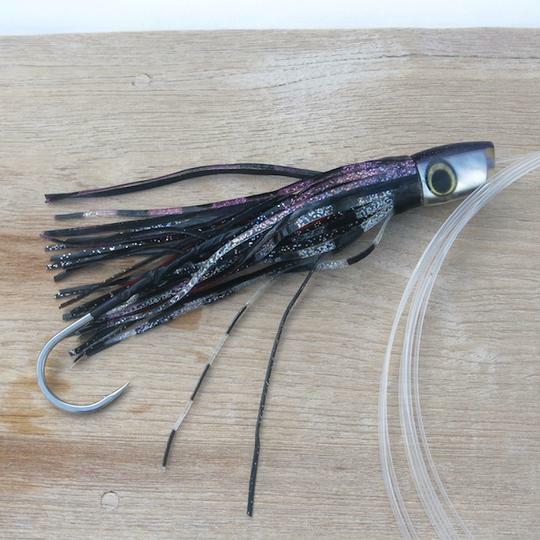 Soaking frisky live baits is the in vogue method in the Gulf these days, with proven results. 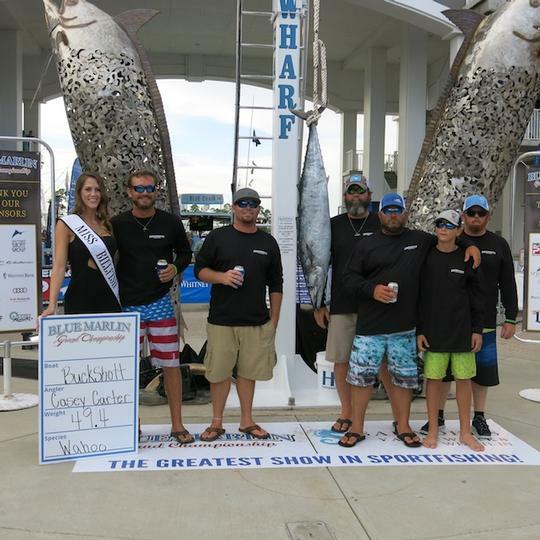 Several noteworthy marlin have been landed the last few seasons with impressive payouts further proof. 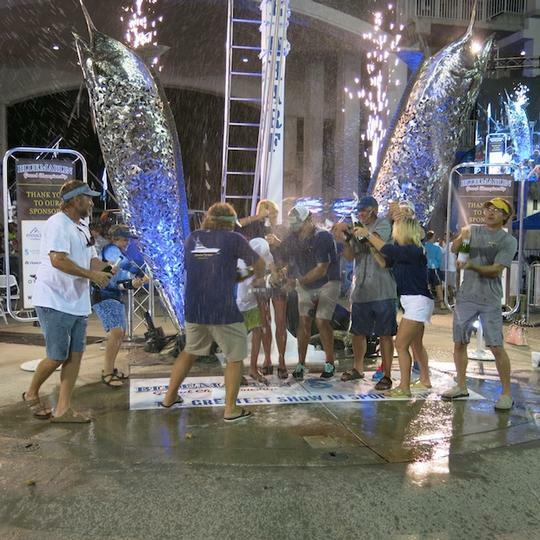 But live baiting isn’t the only way to catch trophy billfish, as CE demonstrated early Friday morning. 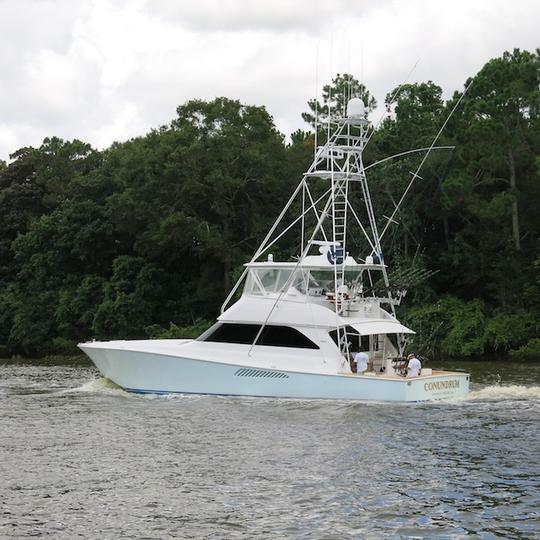 The 61-foot Hatteras owned by Scott Cooper only had lines in the water 10 minutes when a blue marlin pounced on the custom Crimson Tide acrylic swimming lure with a single-hook stiff rig. Fourteen-year-old Ryan Cooper grabbed the 80 Wide outfit and started to crank. “I wasn’t really sure how big it was until a couple minutes into the fight. 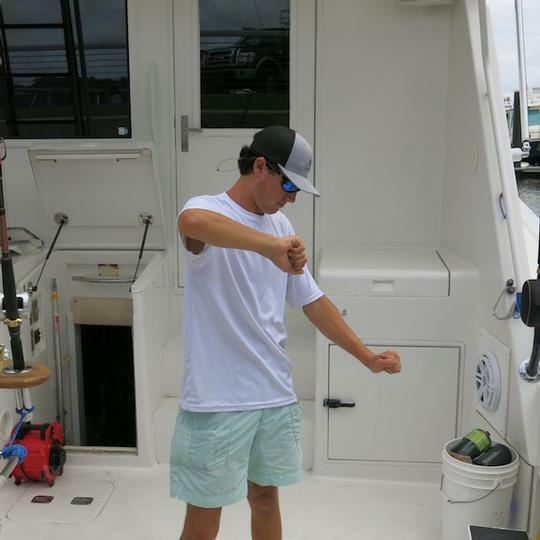 Then that big old tail started flopping and it was on,” Ryan explained as the fish was being off-loaded at The Wharf Marina. “The fight lasted two hours, but the last 45 minutes we had it to the leader 13 times. But she was real docile on that last pass and we slid her right through the tuna door.” The young angler’s catch measured 109 inches long and weighed 437.6 pounds, easily eclipsing the new minimum requirement of 106 inches. 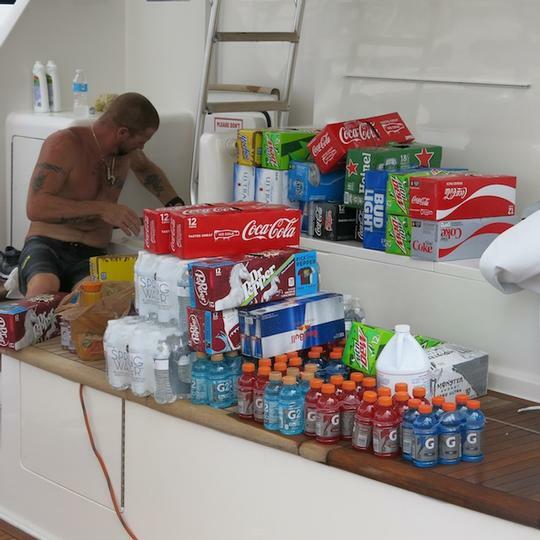 CE, which is based in nearby Point Clear, Alabama, was trolling around the Horn Mountain rig when the strike occurred. 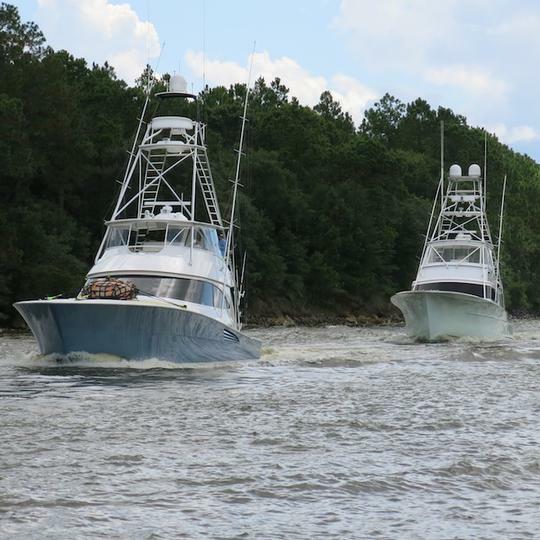 In an unusual juxtaposition, 11 boats were live-baiting nearby around the same rig. 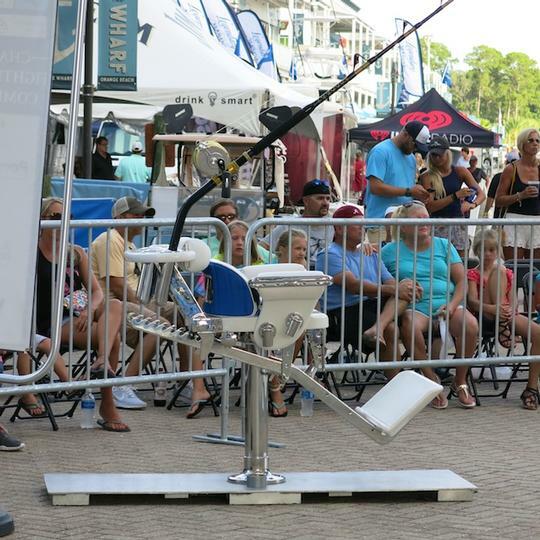 Teams like Done Deal, Born2Run, Breathe Easy, Reel Addiction and several others have certainly shifted the focus to using live baits like small yellowfin and blackfin tuna on the Gulf big-game circuit lately. 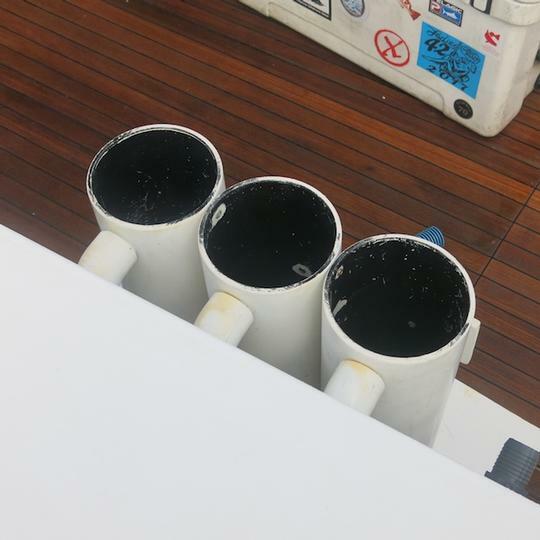 Other boats like to vary the presentation, however. Although Share-E does use live baits if conditions allow, they'll also run spreads of skirted horse ballyhoo or naked “dinks” at times. “It’s more work that way, but it breaks the monotony and keeps the anglers from getting bored,” Roberto adds. 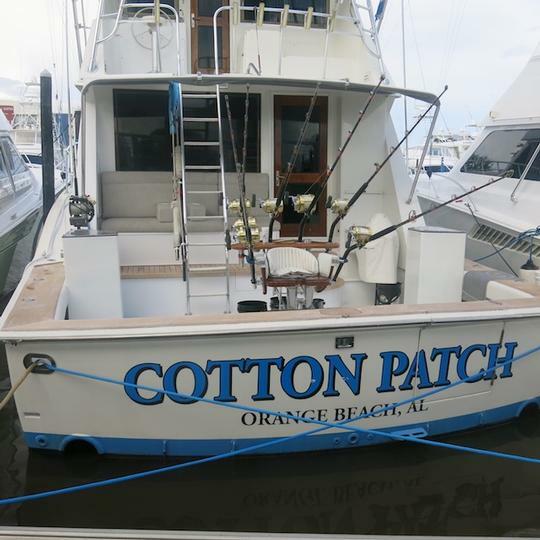 Johnny Dorland and his team aboard Cotton Patch is another crew that has enjoyed success fishing bait and lures over the last few seasons. Live, dead or fake? 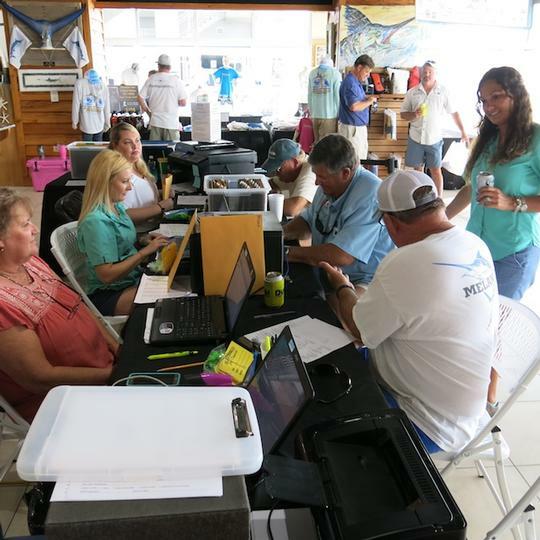 The odds are good all three styles will be represented when the 64-boat fleet returns to the scales later Friday afternoon or again Saturday. Which one will produce the biggest catch? Time will tell. There may even be a Florida State or LSU lure among the mix. The chase is on. 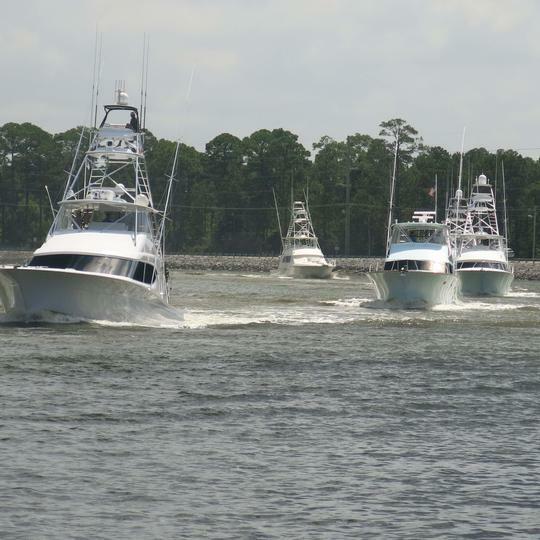 Late Thursday morning, 64 gleaming sport-fishers fired up throaty diesel engines, cast off dock lines and idled through the Intracoastal Waterway before blasting off into the shimmering Gulf. Each is competing for the $1.55 million in overall prize money at stake in this year’s Grand Championship. The financial aspects of big-game tournaments like this one are complicated. 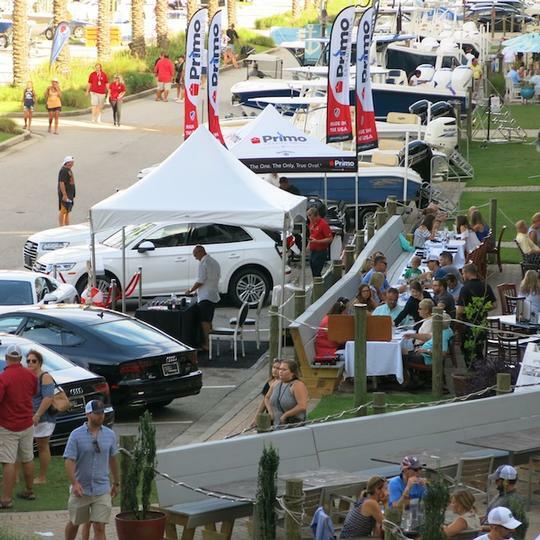 Boats pay base entry fees (totaling $472,500 this year), which is awarded as the guaranteed prize money, minus a tournament operating percentage (typically 10 percent). 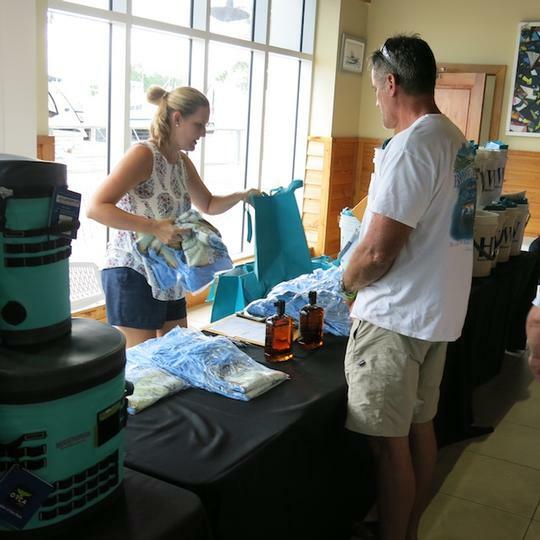 Sponsors help underwrite the cost of parties, trophies and other expenses. But teams can also choose to enter additional categories on multiple levels. 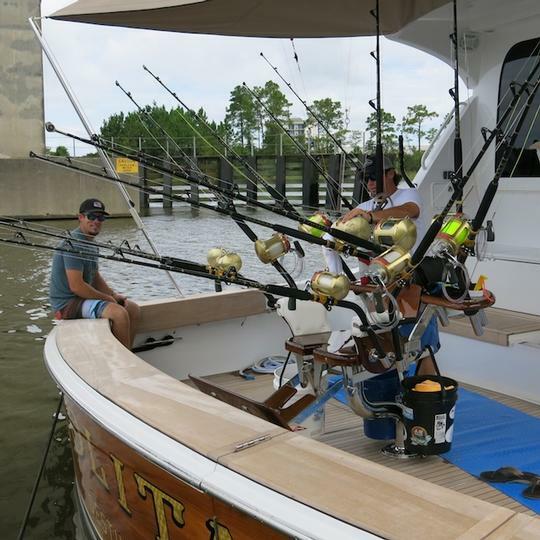 Known as optional entries, calcuttas or simply side bets, these extra fees ($1,078,200) can turn into 5- and sometimes 6-figure payouts, even if a particular boat doesn’t weigh the largest fish. It all hinges on the bets. If categories don’t have any fish entered, that optional money is refunded back to the participating teams. Strategy is involved when placing bets and there’s always a little gamesmanship too. 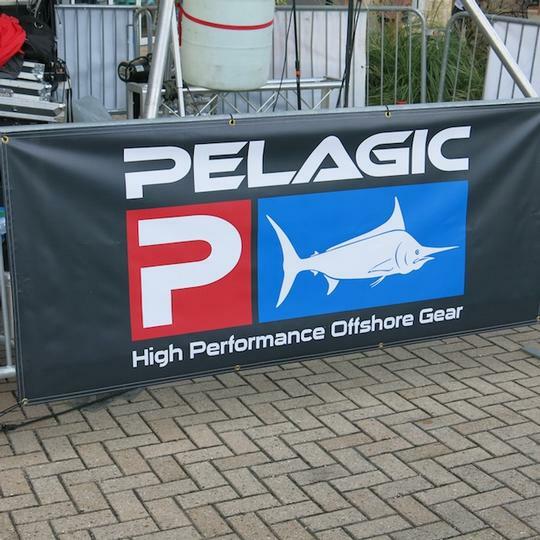 The teams and the public know who has the biggest fish as soon as the weight is announced. But for those placing their bets early, the final score won’t be known until Sunday morning at the awards breakfast. That’s when the dollar signs on those giant checks are finally revealed. "Camaraderie and competition. That's what it's all about. 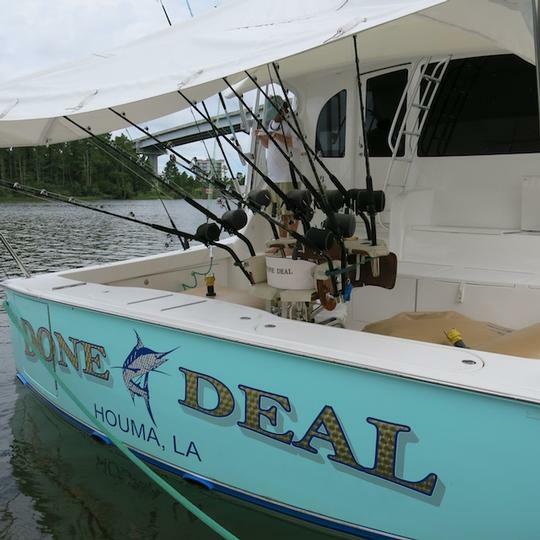 Fishing in the Gulf pits you against the most demanding, aggressive fishermen in the world. Period. They're at the top of their game, yet we’re all family and friends. 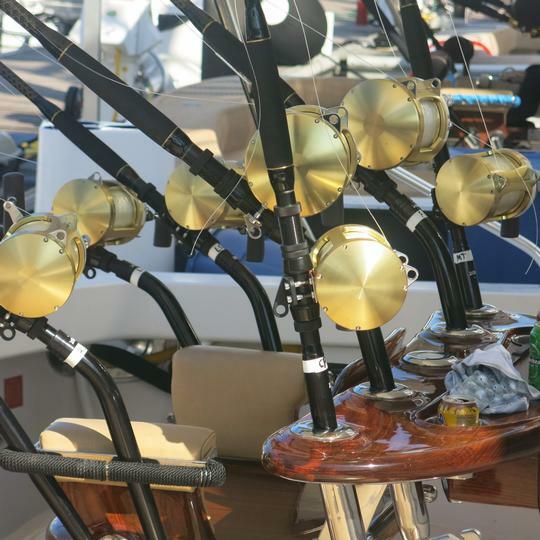 Whether you running a boat, fishing, fixing or selling one, this sport helps us all." "Coming up with a game plan and being successful in the execution. Every fish counts. If I wasn’t doing this, I'd be a football coach." "The variety and level of competition. 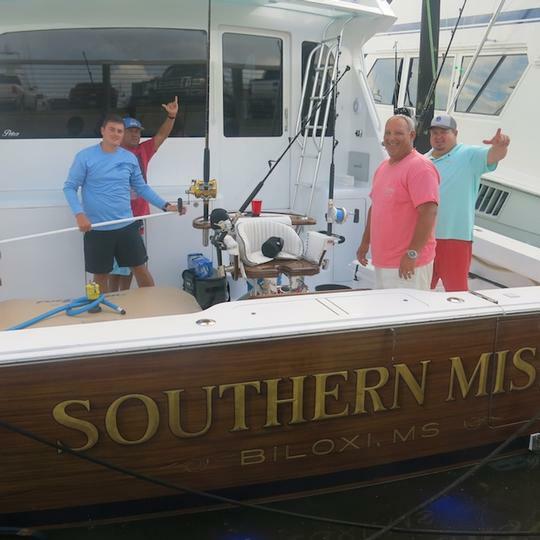 The greatest captains in the world fish the Gulf. People come from all over to be part of it and for me, it's just a pleasure to be on the same scorecard." "You can learn a lot right here, new and different ways to fish from some of the best crews in the world. 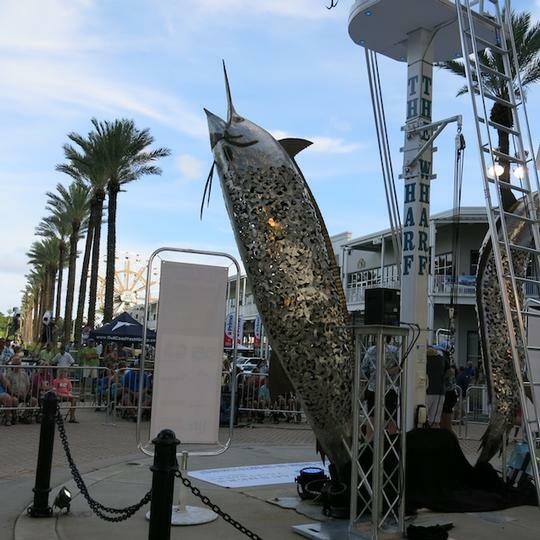 The Gulf of Mexico is the place to be, it really is." "The money. Yeah, it’s the money." 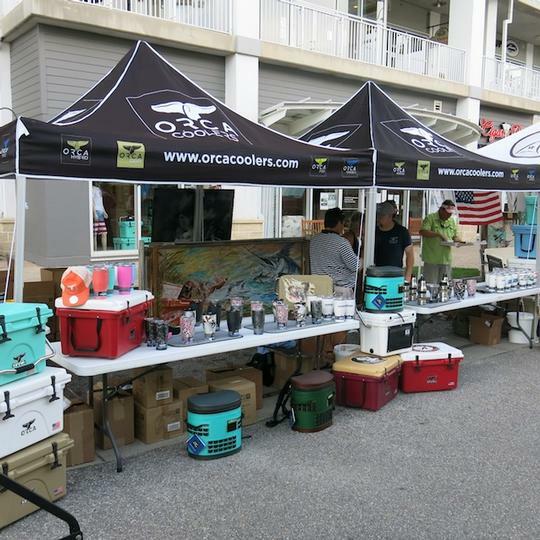 "It's seeing the customers and all the people associated with these events, the captains, mates, anglers and host resorts. I enjoy getting reacquainted every year." "I love being out there with my crew, being able to spend time with them. 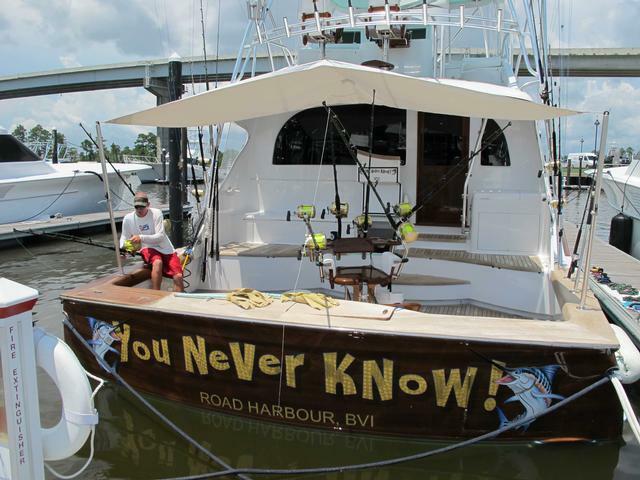 I've met a bunch of great people and have learned a lot by tournament fishing." "It's a competitive sport and I enjoy that. My team consists of family and friends and we’re one of the smaller boats in the fleet, so we have to work extra hard to make it happen." 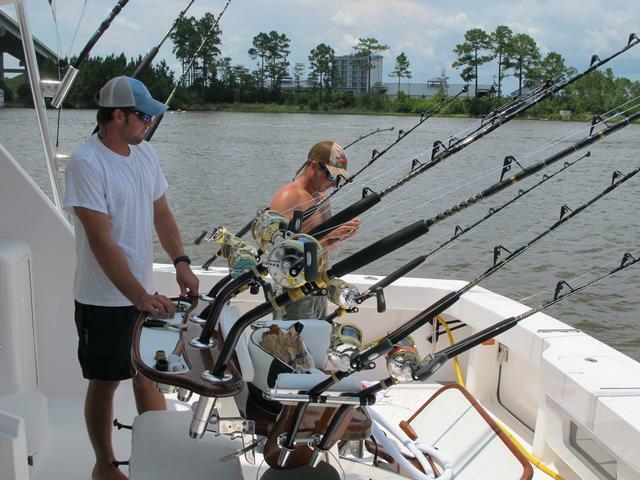 "Hanging out with the mates, captains and anglers. I talk to them on the phone, but it's so nice to meet them face to face. 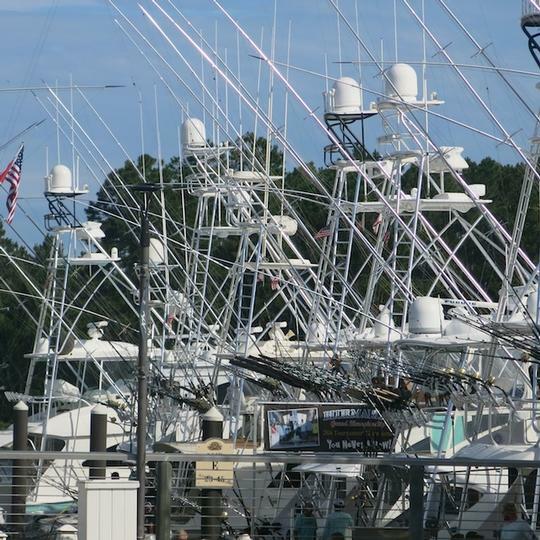 I also love seeing the marina full of sparkling sport-fishing yachts. It's the prettiest sight ever." "All of it. There's so much that goes into tournament fishing. I do love the challenge of harvesting a big fish of 500 to 700 pounds. I played sports in high school so this is how I compete now. The money aspect is nice too. But really it’s the camaraderie and competition among friends. 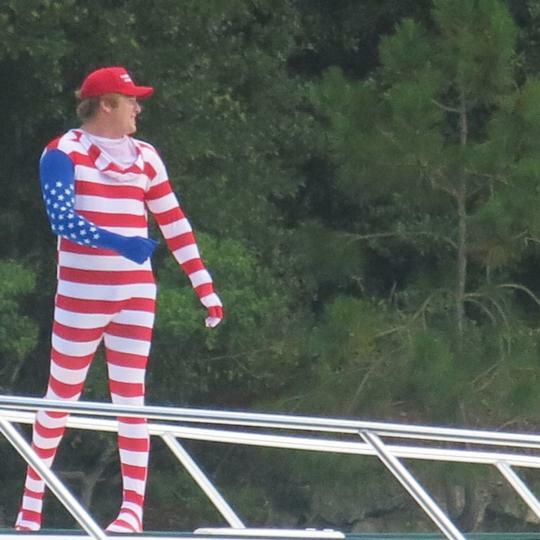 We're like one big family and these tournaments bring everyone together year after year." Numbers and size are the typical standards when judging the health and quality of a particular fishery. 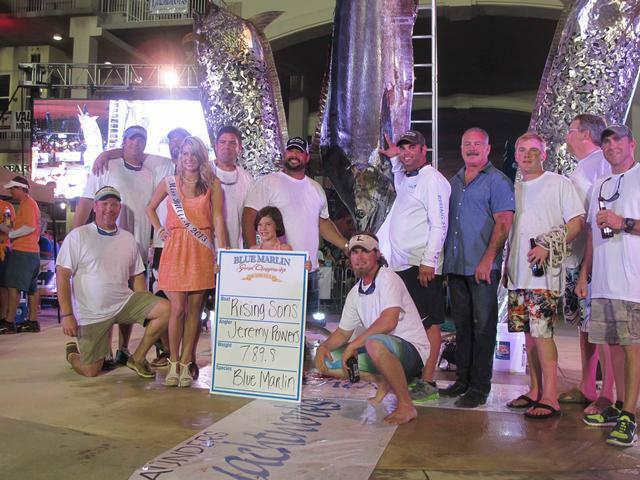 By those criteria, blue marlin in the Gulf of Mexico are in very good shape indeed. Granted, there aren't the double-digit releases per day that can be found in other big-game locales like Puerto Rico, St. Thomas or the Dominican Republic. But many of those fish are smaller blues under 250 pounds. 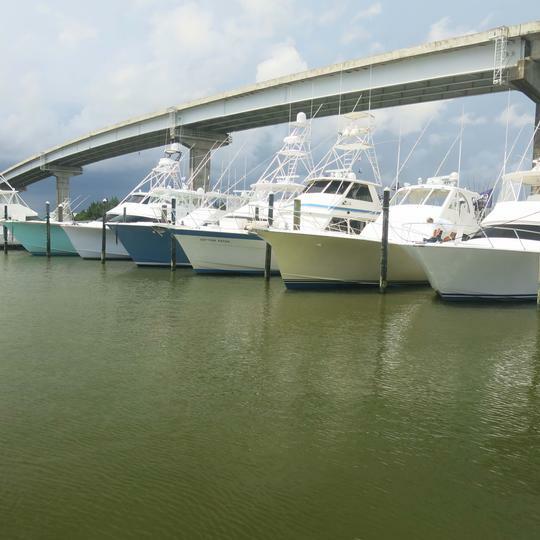 On a hot bite in the Gulf, boats may raise a half-dozen fish and release three or four. The Gulf does, however, produce blue marlin of trophy sizes, the kind with the lengths, girths and weights that rival those found in Madeira, the Azores or Cape Verde Islands. 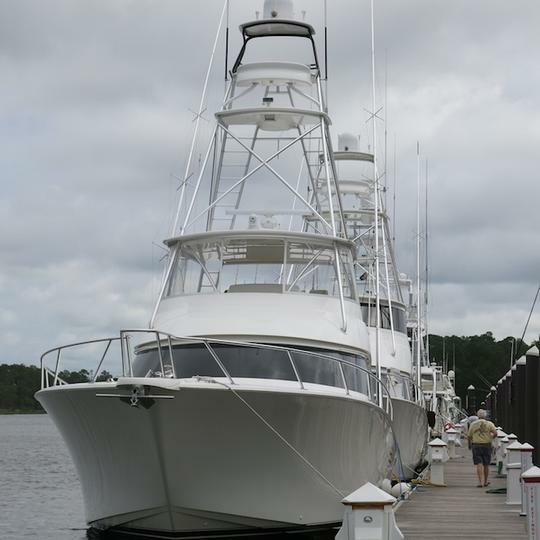 The potential to catch a grander, or a fish exceeding 1,000 pounds in weight, is possible any time a boat leaves port. 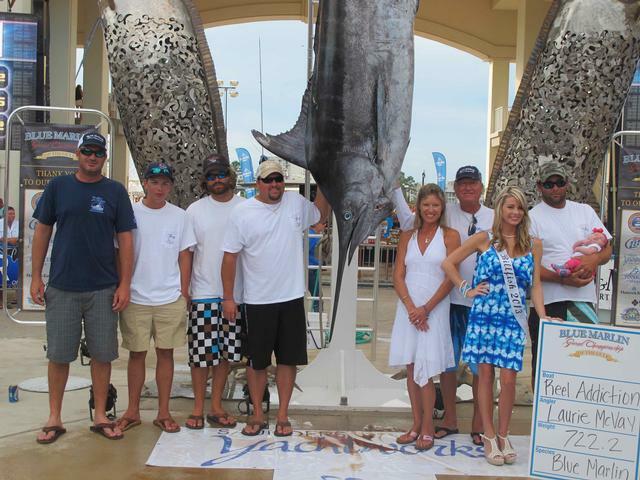 Blue marlin have been caught throughout the year, but the peak season is May through October. 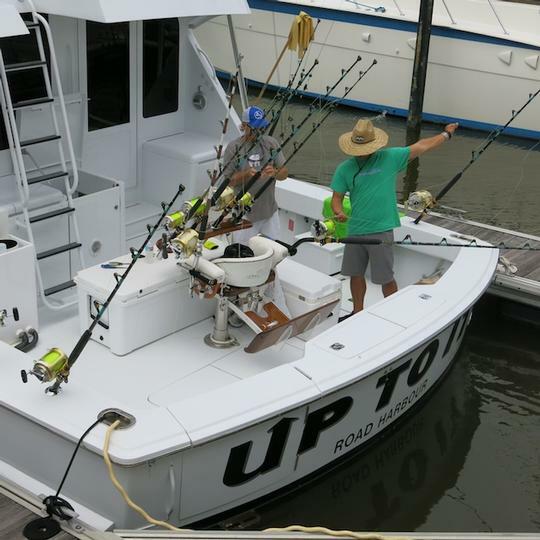 The minimum length to boat a marlin in the region's top tournaments now exceeds the federal limit by five inches or more, with an average size of at least 500 pounds. With several exceptional catches already in the books this season, combined with excellent conditions offshore, the stage is set. 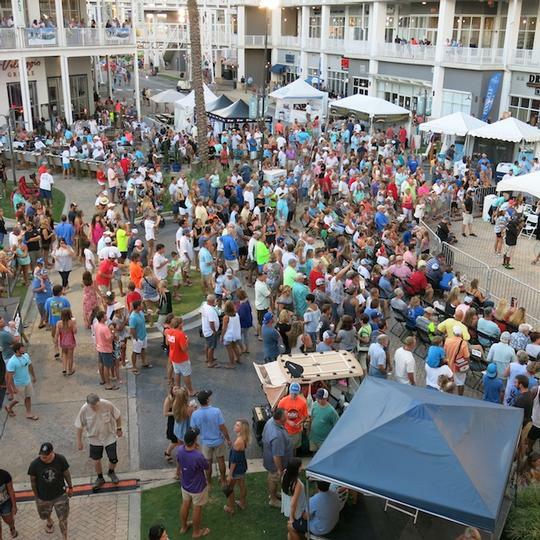 The 2017 Blue Marlin Grand Championship kicks off Tuesday at The Wharf Marina with the top teams in the Gulf competing again for bragging rights and more than $1 million in prize money. 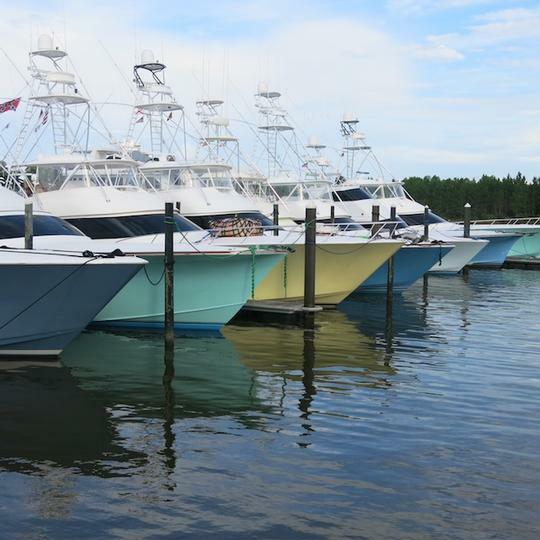 Anything is possible in these cobalt fathoms, one of the top blue marlin destinations on the planet. So when the scales close Saturday night, don't be surprised if sport-fishing history hasn't been re-written yet again. 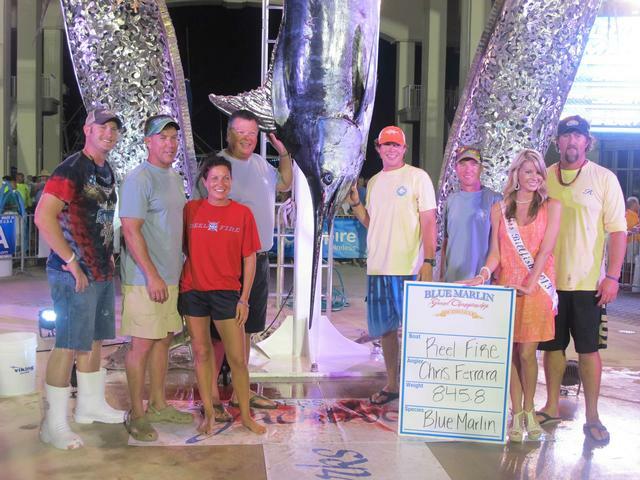 * Denotes State Record Two blue marlin, 1,038 and 809 pounds, were weighed in Veracruz, Mexico. In 1988, angler James Farrow broke the previous Texas record with a 876.5-pound fish. In addition, at least 20 additional blues weighing more than 700 pounds have been documented in Gulf waters, with countless more exceeding 500 pounds. Catch statistics compiled by captaindavelear.com and Capt. 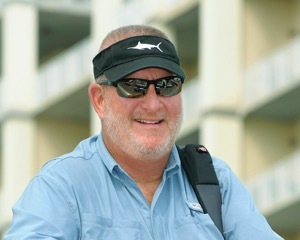 John Cochrane, stingerhooksystems.com. The Gulf of Mexico is a fluid, dynamic environment. Currents shift and water temperatures fluctuate. Key factors like colors, upwellings, downwellings, weed lines and rips evolve constantly. Teams that consistently interpret this data are usually the same ones that end up at the weigh scales tournament after tournament. Capt. 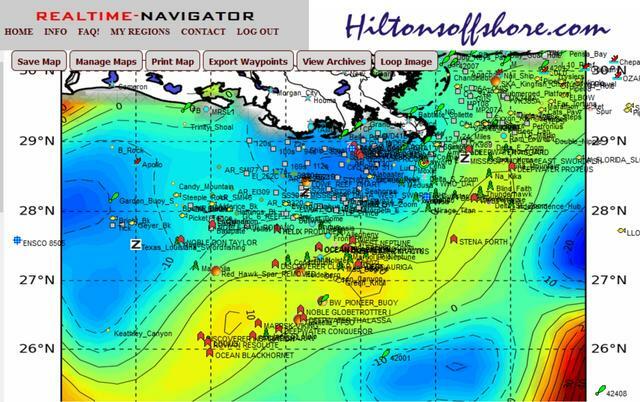 Tom Hilton, owner of Hilton’s Realtime-Navigator forecasting service, is on speed-dial of phones for many of the sport top captains. 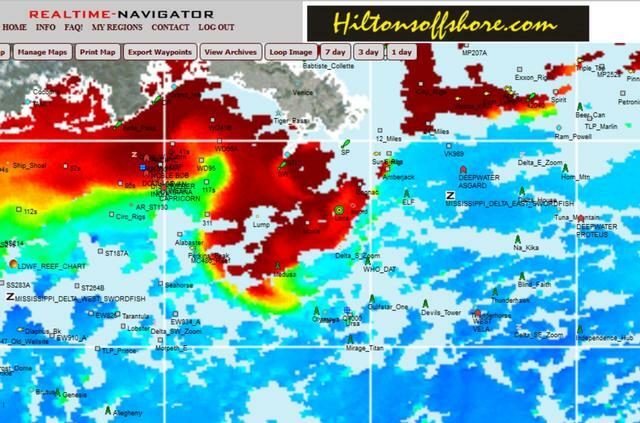 Using satellite imagery and other data, Hilton provides detailed charts to subscribers, who then use that information to pinpoint exactly where they want to fish. 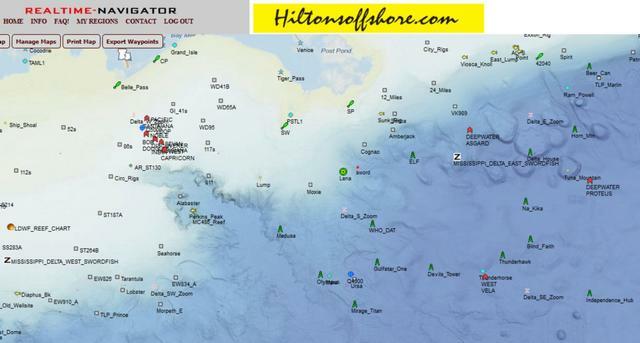 Besides saving fuel, forecasting services like Hilton’s provide several key elements that typically concentrate fish. In addition to showing where the fish are likely to be, these charts also save time by showing where the fish probably aren’t. Currents are the force and direction of water flow. 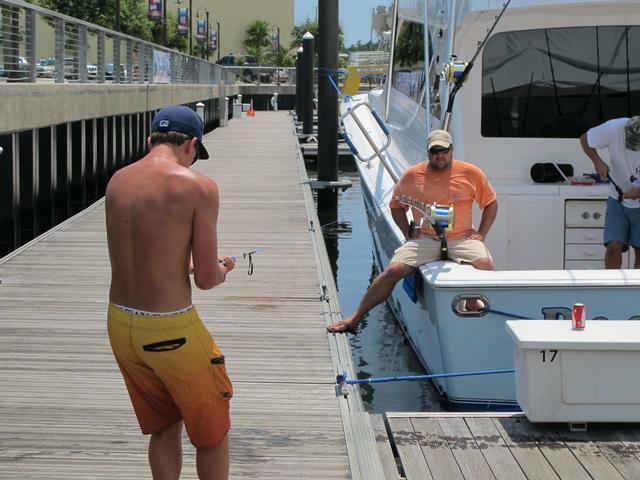 Weed lines or floating sargassum, grass and other debris also concentrate the bait and attract the desired species. Altimetry charts show upwellings and downwellings of current, which also funnel bait. Three-dimensional graphs give a reference to structure on the bottom, such as mounts or ledges, canyons and salt domes. 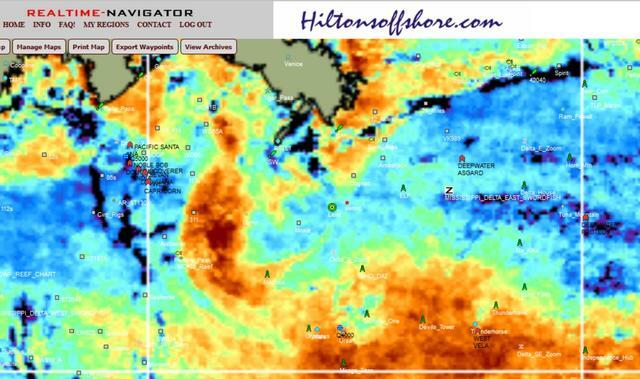 Sea temperature readings are another tool. Abrupt temperature breaks will also concentrate fish. All of these factors can change, sometimes in a matter of hours. Conversely, fishing is usually better the longer conditions remain the same. Hilton subscribers can customize the various charts to meet their criteria and save the choices to the system server. Once offshore, with an internet connection the data can be retrieved even if the boat is outside of cellular coverage. “After users are familiar with the system they can plot those variables and project changes,” Hilton adds. “They can also add waypoints and bearings to run directly to the best spots. They won’t be sitting around green felt tables dealing cards come Thursday morning. But you can bet the expected field of 63 teams will be staring intently at computer screens and chart plotters long before lines go in the water. All will be searching for the ideal alignment that’s holding the championship fish. The 4th of July fireworks have boomed, popped and sputtered in descent. But another dazzling show is still going on offshore. 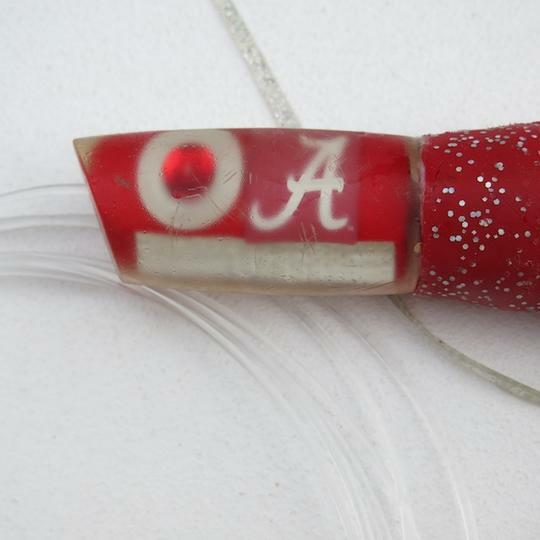 It’s July and the world-class potential of the Gulf of Mexico is in the sport’s brightest glare. As we head into next week’s BMGC showdown, surface water temperatures are in the 80s, tides will be strong following Sunday’s full moon and cobalt blue water is butting up against chocolate brown from the Mississippi, forming bright distinct lines that look like paintings in a second-grade art class. A recap of the past week offers a preview of coming attractions. 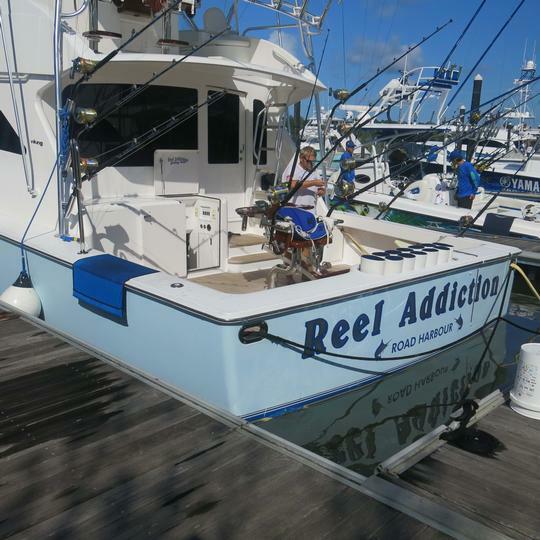 Reel Addiction got things started when angler Ben Arnold whipped a 771.4-pound blue marlin to capture first place in his hometown Pensacola International Billfish Tournament over the holiday weekend. 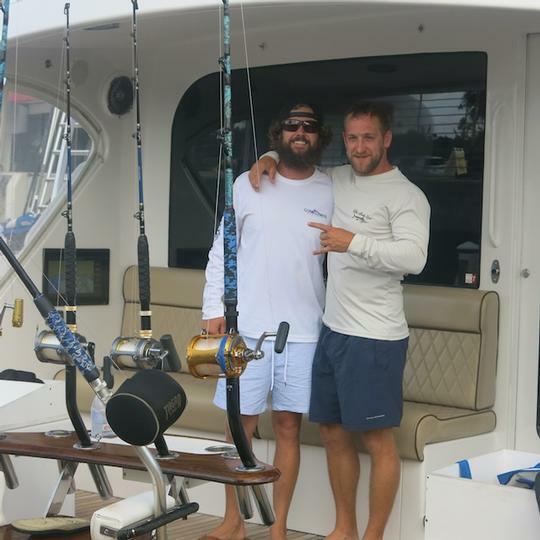 Then, on the 4th, Done Deal followed up with a 600-pound blue for the winner-take-all $1 million dollar total purse in the 2017 Blue Marlin World Cup. Done Deal is a Gulf multi-tournament winner and former Triple Crown Champion. 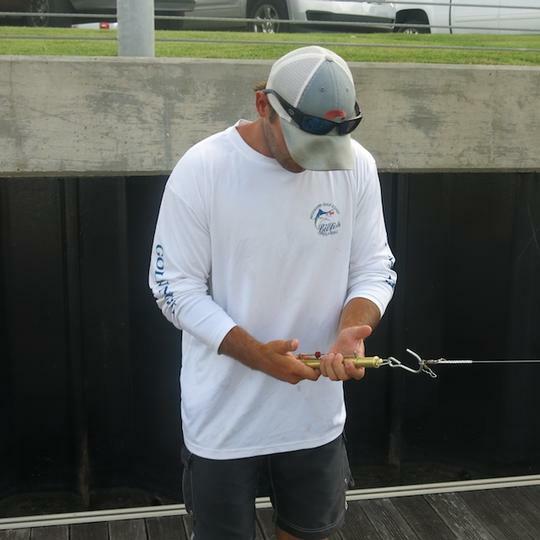 Still, angler Wilks Hammock, owner Jon Gonsoulin, Capt. Jason Buck and the crew topped 143 other teams around the globe, including dozens in grander hot spots like Bermuda, Kona, Madeira and the Azores, to claim the top prize. His skipper, Capt. Scooter Porto of Pensacola, agrees. Porto says the brilliant blue water that was present last weekend is slowly being pushed south. 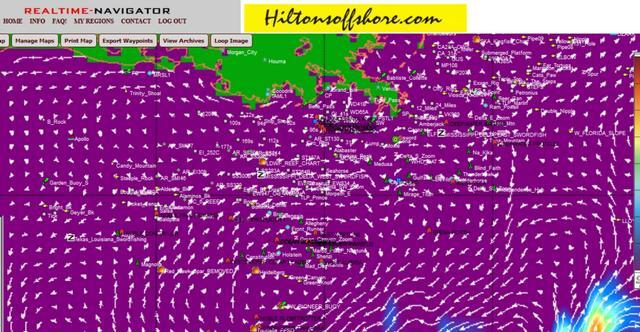 Conditions change constantly and he’ll take data from Hilton’s Real-Time Navigator and weather sources into consideration before making the final decision on where to fish. 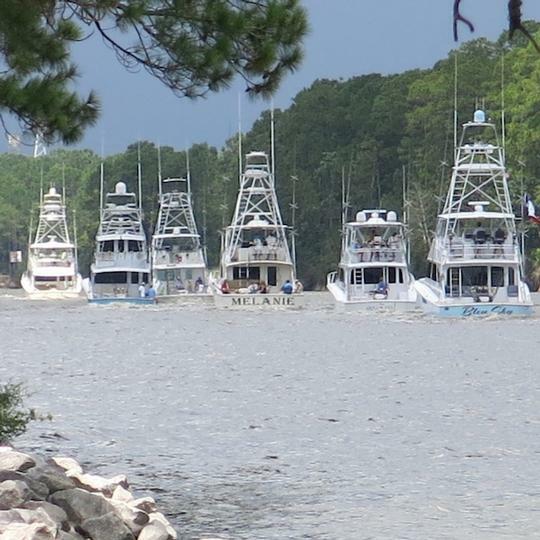 Competition in the 2017 Blue Marlin Grand Championship begins following Thursday’s boat parade departing from The Wharf Marina in Orange Beach. The “Ooohs, aaahs and wows” will be clearly audible as soon as the scales open next Friday evening.